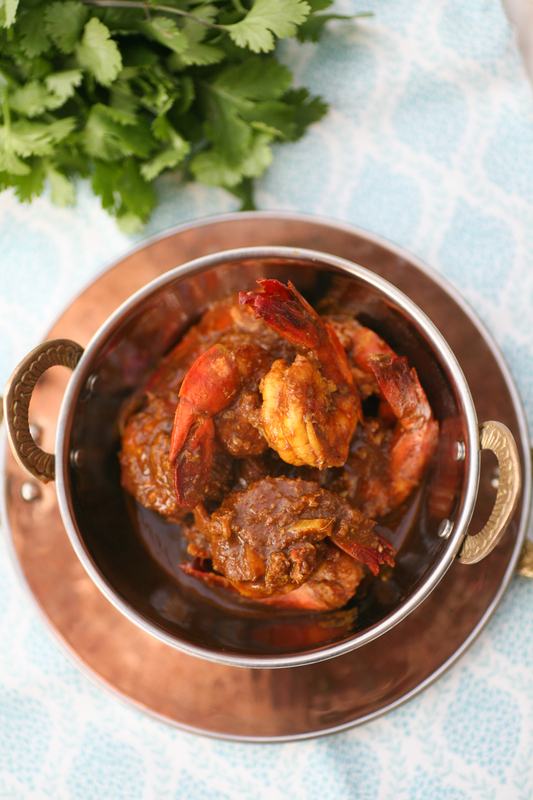 Prawn curries are one of my favourite. Earlier this year another of my prawn recipes made its way into Delicious Magazine – see here – have you tried it yet? 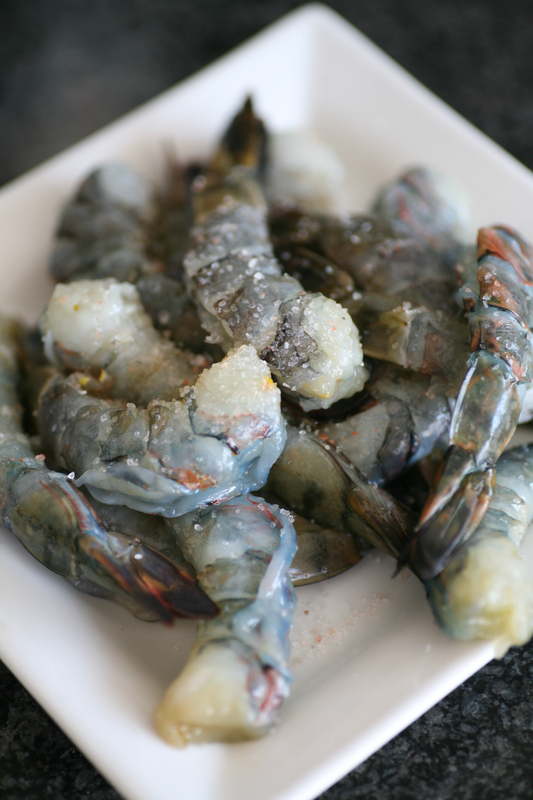 Decadent and spoiling, prawns are incredibly tasty, especially if they are of the king prawn variety. I am also a huge fan of tamarind, which has a very sweet and sour taste to it. 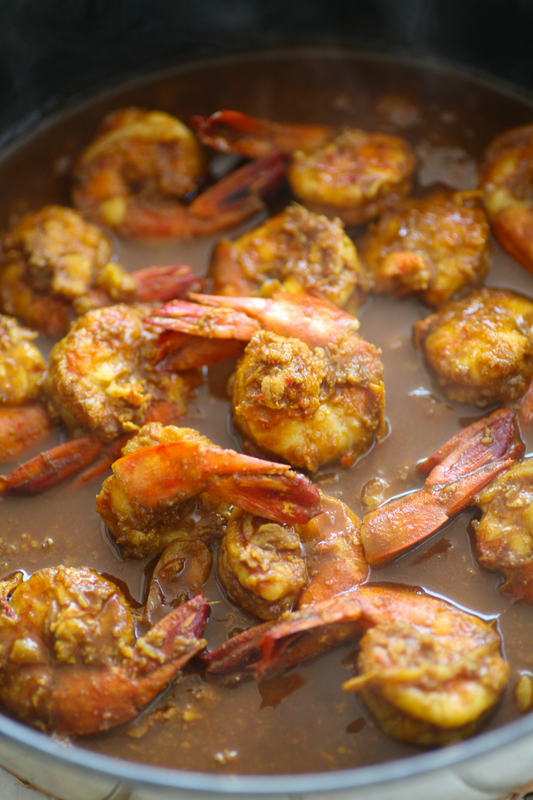 So married together prawns and tamarind create a very satisfying meal. These beauties start off grey, but rest assured as soon as they are cooked in the oil they turn pink almost immediately. I leave the tails on, more for cosmetic reasons than for any other. The rest of the shell is removed, but not discarded (next week I will show you what to do with all those discarded shells and heads), and the black vein that runs along the prawns back is discarded completely. Other than peeling and deveining the prawns, this dish is incredibly quick to make and totally doable on a busy work week. Taking time to eat a delicious, comforting meal in the evening I think is so important. If you invest a little bit of time in preparation you really are rewarded with a memorable feast. Peel, devein (make an incision down the back of the prawn to reveal a black vein, remove with a sharp knife and discard) and keep the tails on, scatter with the salt and then place to one side. Don’t forget to keep those shells and heads and I will show you how to make a magnificent prawn broth which turns into a prawn bisque next week! In a small bowl add the tamarind pulp, ground cumin and coriander, chilli powder and turmeric. Stir to form a smooth paste. Heat the oil in a pan on a medium low heat and then add the garlic and ginger. After a minute add the prawns and stir for a further minute so that they become a lovely pink colour. Add the tamarind paste and coat the prawns. Immediately add the boiling water and stir. Simmer gently for a further 5 minutes. Serve immediately with either rice, puri or other Indian flat bread. 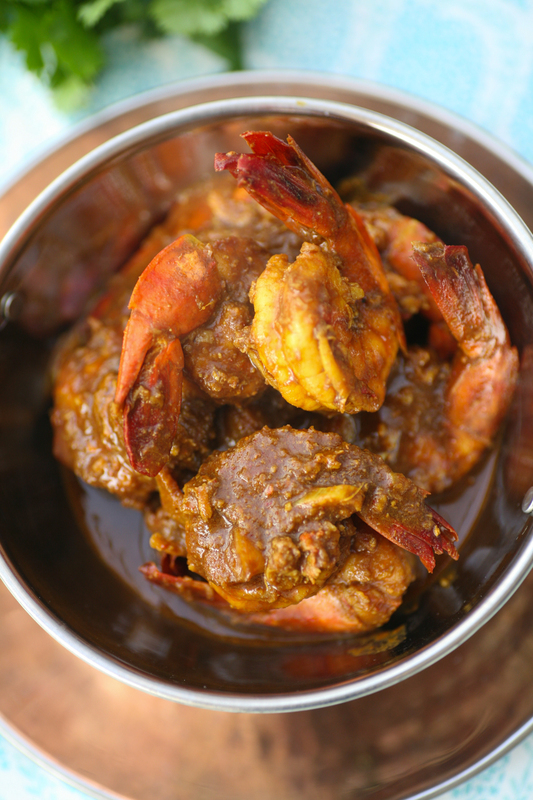 This entry was posted in Fish, prawn and tagged curry, easy, Indian, prawns, supper, tamarind. Bookmark the permalink. What an enticing combination, I can nearly smell this wonderful curry. Congratulations on being published in Delicious, Torie! I am sorry I missed it in print but thanks for reproducing it here for us. 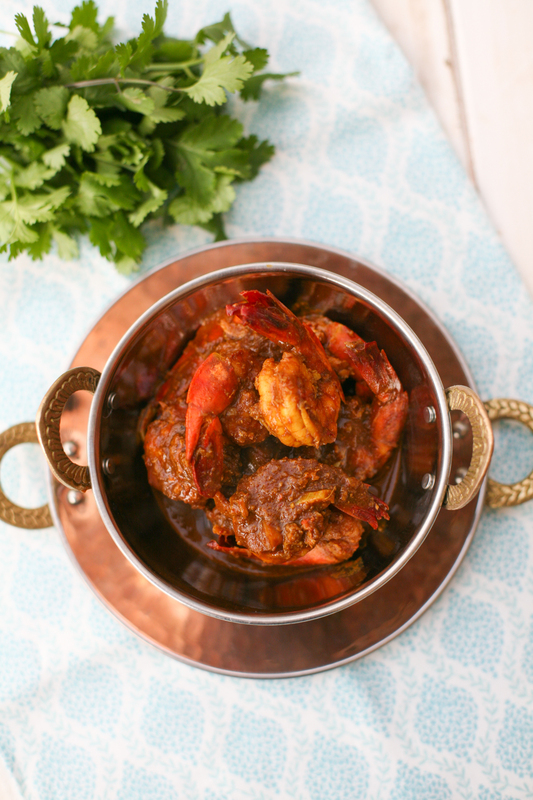 We love tamarind curries. Especially easy, midweek style ones like this beauty. Pinning for making soon!